For its size, Vancouver offers a remarkable array of classical music, featuring an endless stream of international artists that almost completely fill up a calendar in core months. Vancouver has a total of 15 musical institutions, and these provide both distinction and balance over all musical genres, whether it be symphony, chamber music, solo recital, early music, new music or opera. Coming off a very successful 95th season under Maestro Bramwell Tovey, the VSO maintains its focus on ‘festivals’ as a way of generating a sense of occasion in the concert hall. The New Music Festival takes place again in January, the Pacific Rim Celebration occurs at the end of February, and the extended Mozart-Plus Springfest runs from April 10-18. The two ‘celebrity’ concerts feature Lang Lang playing Mozart (March 18) and Yo-Yo Ma playing Dvorak (May 1). The popular VSO Chamber Players continue their 4-concert series and the enterprising, 3-concert Symphony at the Annex series introduces more modern experimental music in the spring. The fall season starts boldly with pianist Inon Barnatan joining Maestro Tovey and the VSO for Brahms Piano Concerto No. 1, coupled with Richard Strauss’ Also Sprach Zarathustra (September 27/29). Then comes the first concert of what could be a mini-British festival, featuring Ariel Barnes in Elgar’s Cello Concerto alongside Vaughan Williams biting and dramatic Fourth Symphony (October 4-6). The second occurs a month later (November 8/10), where Maestro Tovey takes on Benjamin Britten’s splendid War Requiem. In between is young conductor Joshua Weilerstein with pianist Adam Golka (October 17-20) and celebrated Canadian pianist Marc-André Hamelin playing Mozart (November 1/3). One of the most cherished of all British violinists, Tasmin Little, arrives for November 15-17 to play the Korngold concerto, while returning conductor James Gaffigan takes on Shostakovich’s titanic ‘Leningrad’ symphony (violinist Philip Quint also playing Mozart) on Nov 29/ Dec 1. The year closes out with a concert of some intrigue: Midori’s very accomplished younger brother, Ryu Goto, also a violinist, challenges the Brahms Violin Concerto just like Midori herself did two seasons ago. After the New Music Festival, the main concerts for 2015 start at the end of January. Kirill Gerstein should be just the right man for Shostakovich’s enigmatic Second Piano Concerto, and he appears alongside very young British conductor Ben Gurnon, recently appointed as a Dudamel fellow and appearing at this year’s Proms (January 24/26). Maestro Tovey turns his attention from Mahler to Bruckner’s Fourth Symphony (Jan 31/ Feb 1/2); young Calgary native Katherine Chi also contributes Prokofiev’s Third Piano Concerto. The concert of Feb 14/16 is exciting for two reasons: first, Vancouver’s own Dale Baltrop performing Bartok’s First Violin Concerto; second, young and engaging Danish conductor Thomas Sondergard in Haydn and Beethoven. Sondergard already holds two titled positions with British orchestras. February 20/21 brings the principal choral concert for the spring, highlighted by Mendelssohn’s always-inspiring Second Symphony (“Lobgesang”). The Pacific Rim Celebration at the very end of the month focuses on the music of Japan and enlists young conductor Perry So, who stood in at short notice so successfully last season. Assistant Conductor of the Cleveland Orchestra, James Feddeck, joins the young and impressive violinist Timothy Chooi, a Victoria native, playing the Bruch concerto on March 7-9. After Lang Lang on March 16th, there is only one major concert before the Spring Festival; the prodigious Yevgeny Sudbin plays the great warhorse, Tchaikovsky’s First Piano Concerto, with young American conductor Ryan McAdams, who contributes Stravinsky and Ravel on his own. The Mozart-Plus Springfest (April 10/11/13/16/18) is unusual in it is designed in the spirit of a documentary of Mozart’s life, with an initial screening of Amadeus. Understanding the musical links in Mozart’s life will be a rewarding journey for many, and includes such things as Rimsky-Korsakov’s operatic take Mozart and Salieri. Maestro Tovey and the orchestra do Mozart’s last three symphonies and the Requiem as core works. The late spring concerts start with Jeffrey Kahane as both pianist and conductor in Beethoven, Haydn and Shostakovich (April 24-27). Right after the Yo-Yo Ma ‘special’ on May 1 (Dvorak Cello Concerto), scintillating young violinist Ray Chen takes over to play Sibelius (May 2/4). Celebrated Canadian Angela Hewitt then arrives on May 9-11 to play both Falla’s Nights in the Gardens of Spain and Ravel’s Left-hand Concerto. Another esteemed Canadian pianist, Janina Fialkowski, follows May 23/24 to do the (other) Ravel concerto in G major. After an appearance of popular virtuoso violinist Karen Gomyo, performing the Mendelssohn concerto with returning guest conductor Jun Markl (May 29- June 1), Bramwell Tovey finishes out the season in style: a concert performance of Bernstein’s Candide ((June 6/8) and Mahler’s Fifth Symphony (June 13/15). For the past 35 years, artistic director Leila Getz has consistently been able to find the most promising young musicians for her ‘Next Generation’ series and to programme these with a variety of the world’s most distinguished mature artists. This creates seasons of great variety and innovation, and it is wonderful over the years to see artists who originally were sponsored by VRS continue to return here in their celebrated prime. This spring season features the return of four of today’s most enterprising and distinguished pianists: Emanuel Ax playing Debussy and Chopin (January 18), Steven Osborne in Beethoven (February 22), Sir Andras Schiff with the last sonatas of four composers (March 1), and Paul Lewis with his new thoughts on Beethoven (May 31). Lewis performed the complete cycle of 32 sonatas for VRS a number of years ago. Equally inspiring, renowned cellist Steven Isserlis will join forte-pianist Robert Levin in the Beethoven’s Complete Cello Sonatas and Variations (March 13 – 15). Vancouver audiences have long become accustomed to ongoing visits from the world’s most celebrated string quartets under the auspices of the city’s oldest chamber music society (founded in 1948). This season almost outdoes itself, at least in the fall, since three of the most distinguished quartets on the scene, the Emerson Quartet (October 7), Quatuor Mosaiques (November 2) and the Takacs Quartet (December 9) will appear. With new cellist Paul Watkins, the Emerson’s seem to be moving in new directions, this time featuring quartets by Benjamin Britten and Lowell Liebermann. The Haydn and Mozart concert with the Quatuor Mosaiques, the pioneering ‘authentic instruments’ string quartet, is appropriately co-sponsored by Early Music Vancouver. The Takacs play late Beethoven once more, and violist Erica Eckert joins them for Mozart’s famous G minor Quintet. In between is the young and highly touted Escher Quartet (November 18), a former BBC New Generation Artist and resident quartet with the Chamber Music Society of Lincoln Center. The presence of Lincoln Center artists, with former Emerson cellist David Finckel and his wife, pianist Wu Han, is everywhere in the spring season, giving us almost another festival over three concerts. The first (January 20) features Brahms and Dvorak String Quintets. The Finckel-Han-Setzer Trio then give us Beethoven and Brahms Piano Trios (February 15) while enterprising violinist Daniel Hope and violist Paul Neubauer join Finckel and Han for a concert featuring only piano quartets (April 14). To start the New Year is the exuberant young Pacifica Quartet, with venerable pianist Menahem Pressler, now over 90. A long-standing returnee, the Prazak Quartet, will illuminate Czech classics (March 10) and one should get quite excited by the Canadian octet, Octagon, performing the Beethoven Septet and Schubert Octet (March 24). With the likes of Martin Beaver, Rivka Golani and James Campbell present, this should be a vibrant musical experience. The Chopin Society complements the above organizations very well by expending great efforts to bring us recent Chopin Piano Competition winners, as well as other very distinguished pianists dedicated to the composer as well as other specialties. Brazilian Arnoldo Cohen, a patrician artist well known to piano connoisseurs, starts things off on November 30. Then comes the remarkable young Frenchman Alexandre Tharaud (January 30). Distinguished Argentinian Nelson Goerner follows (March 13), and the 4-concert season closes with the very young winner of the 2012 Dublin International Piano Competition, Nikolay Khozyainov (May 8). Early Music Vancouver is one of the founding early music organizations in North America, consistently bringing the highest level of “authentic instrument” performance to the city. EMV is closely associated with the Pacific Baroque Orchestra, whose 2012 recording of Handel’s Orlando has received the highest level of critical praise internationally as well as winning a Juno award. Following up on last year’s great success with Israel in Egypt, this year’s summer festival takes Pacific Baroque and Alexander Weimann to Handel’s first oratorio, Il Trionfo del Tempo. And during this season there is another triumphant showing: Handel’s Theodora (Feb 14). Under the leadership of Matthew White, this season also sees a stronger integration with two other premier early music organizations in the northwest, Seattle’s Pacific MusicWorks and the Portland Baroque Orchestra. After their magnificent performance last year, Monica Huggett and the Portland Baroque will return May 1 for a concert that includes Vivaldi’s The Four Seasons. After the opening concert (October 3) that features acclaimed American tenor Michael Slattery and Montreal’s Le Nef—breathing life into the great John Dowland—Stephen Stubbs and Pacific MusicWorks will perform in two concerts before Christmas. The first gives us Monteverdi’s dramatic eighth, and last, Book of Madrigals (November 9); the second features three of the six cantatas from Bach’s Christmas Oratorio (December 21). Besides the three distinguished co-sponsored concerts, Quatuor Mosaiques (November 2) and the two concerts involving fortepiano discussed earlier (Kristian Bezuidenhout playing Mozart on March 8, and Isserlis and Levin playing Beethoven on March 13-15), one could hardly do better than the two counter-tenors also appearing in the spring: Charles Daniels in the English Orpheus (February 25) and Jeffrey Thompson (accompanied by Ensemble La Rêveuse) in Henry Lawes (March 27). Gone are the days when the Vancouver Opera stuck slavishly to mainline works in their season. In recent years, we have seen the likes of John Adams’ Nixon in China, the Canadian premiere of commissioned opera Lillian Alling by John Estacio, and Tan Dun’s Tea: A Mirror of Soul. Last year was relatively less controversial, only one slight move off the norm with Britten’s Albert Herring. 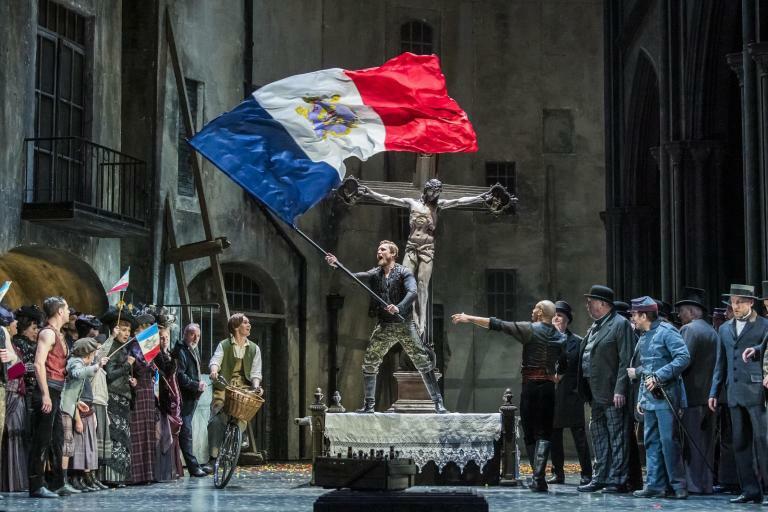 This year, on the other hand, there is only one bona fide mainline opera, Bizet’s Carmen, which opens the season and runs in six performances from September 27 to October 5. Mezzo-sopranos Kate Aldrich and Ginger Costa-Jackson share the title role, and tenors Richard Troxell and Khachatur Badalyan alternate in the role of Don Jose.Then Stickboy, a newly commissioned chamber opera by Canadian composer Neil Weisensel and poet/librettist Shane Koyczan, deals with the vulnerabilities of a young boy facing a conformist and bullying society. The world premiere takes place at Vancouver Playhouse on October 23rd, conducted by Leslie Dala, and runs for 11 performances until November 7th. In the spring, VO presents an operetta and a musical. Johann Strauss’ Die Fledermaus is the familiar item, running from February 28th for four performances until March 8th, and featuring soprano Joyce el-Khoury as Rosalinde, tenor Roger Honeywell as Gabriel von Eisenstein, and Christopher Gaze as the tipsy jailer, Frosch. Mezzo-soprano Julie Boulianne and baritone Hugh Russell also return to the VO stage; Jonathan Darlington conducts. Stephen Sondheim’s musical, Sweeney Todd (1979), completes the season, and runs for six performances from April 25th to May 3rd. Often referred to as a “musical thriller,” it has been revived in very recent years in London and elsewhere, and is being performed in a number of U.S. cities this season. The cast stars real-life husband and wife Greer Grimsley, one of the supreme bass-baritones of his generation, and acclaimed mezzo-soprano Luretta Bybee. Canadian soprano Andriana Chuchman, fresh from a bravura debut performance at The Met, will sing Johanna. Jonathan Darlington again conducts. One can never forget the decades and decades of inspiring concerts given by the Vancouver Chamber Choir under conductor Jon Washburn. Eleven concerts will be given this season at Ryerson United Church, starting on September 26th, with six before the New Year. In addition, there are performances from the award-winning Vancouver Cantata Singers. Even more chamber music is available in the 5-concert series of Vetta Chamber Music and the 4-concert series of West Coast Chamber Music. All the performers here are first-class, some having strong associations with the VSO; others are faculty members in the School of Music, UBC. Opera flourishes as well with City Opera Vancouver; their recent production of Margaret Atwood’s chamber opera Pauline was a resounding success. Finally, enterprising presentations are coming by Vancouver New Music, Turning Point Ensemble, and Music on Main.